Most people believe that raw foods are better for you than cooked ones. The basis of this is often bound up in myths of what people think constitutes our “natural diet”, particularly given the popularity in recent years of diets like the paleo diet and the raw food movement. The assumption is that, since fruit and vegetables are naturally in a raw state, and before the invention of fire our ancestors ate food raw, this is a more “natural” state, and therefore better, way to eat food. That said, the average lifespan of someone in the Paleolithic period was about 33 yrs. You would have been lucky to make it to 40. Sure, some of them probably got eaten by saber toothed tigers and infant mortality was high and what-not, but diet was certainly not uniform around the world. What about the Inuit, who have survived mostly on whale blubber? What if you are allergic to raw fruit and vegetables? If you’re like me and have oral allergy syndrome and can’t eat certain fresh fruits and vegetables, you might be wondering if cooking, boiling or steaming destroys the nutrients in foods. You might be worried about eating a balanced diet if you’re allergic to most raw foods. The good news is that the nutrients in many vegetables actually improve with cooking, steaming, sauteing, and yes, even microwaving. I have what's known as oral allergy syndrome (OAS), which is a hay fever related condition that causes allergies to all kinds of fresh fruit, vegetables, nuts, soy, and wheat. It can cause stomach upset, hives, itchiness, swelling, and more. IT can be pretty serious, some people can even go into anaphylactic shock after being exposed to certain foods. The thing about oral allergy syndrome fruits and vegetables is that most of them can be safely had by most people if they are peeled and/or cooked, boiled or steamed. The heating process helps to destroy the allergen-proteins and make the foods safer to eat. And for those of you who worry that heating foods might destroy the nutrients, fear not. In many cases heating helps release nutrients. But before I tell you all about that I have to tell you that I'm not thrilled about the raw food movement. I'm happy for you all, really, that you can turn a handful of dates and seeds and nuts into healthy energy bars and that you can shred some zucchini and slap some raw tomatoes on it and call it pasta. That's awesome. Am I jealous? Yes. A little bit. But if I hear one more smug raw foodie tell me that if I just ate more raw fruit and vegetables and nuts maybe I would be healthier and my allergies would get better, I'ma gonna get angry. Sure, cuz if someone was deathly allergic to peanuts, you would suggest they ate a jar of peanut butter to heal themselves. As if I caused my allergies by not eating healthy. Thank you but I've endured enough blame for my allergies over the years. There is plenty of research to suggest that allergies are actually determined as early as in the womb, and that all kinds of external factors such pollution, pesticides, antibiotics and more can imbalance the immune system and cause allergies later in life. If you don't believe me, you can read all about it in my new book Living with Oral Allergy Syndrome: A Gluten and Meat-Free Cookbook for Wheat, Soy, Nut, Fresh Fruit and Vegetable Allergies (you can read the first 22 pages on my blog, or you can Order from Amazon.com here .) The book includes 10 pages on the potential causes of hay fever, food allergies and oral allergy syndrome, and 5 chapters of healthy recipes for cooked fruits and vegetables and non-OAS related foods. Anyway, on to the heating. In the case of carrots, courgettes and broccoli, an overall increase in antioxidant was found in steamed vegetables over raw. This likely because the steaming softened the vegetables and increased the ability of compounds to be extracted and be converted into "more antioxidant chemical species." I'm assuming these are good species, as opposed to the alien kind that Sigourney Weaver has been known to battle. This is not the time or place to get into the microwave debate, I'm just relating a study here! Microwave or not as you please. My suggestion, though, is that if you do microwave it's better to use glass containers and never plastic, or plastic wrap, as these can leach creepy chemicals into your food. 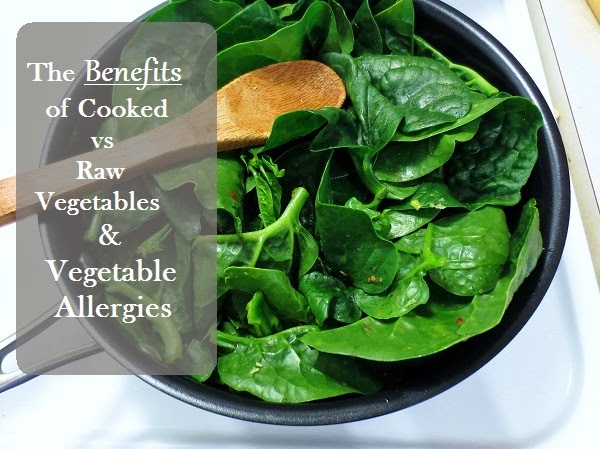 Of course, greens aren't necessarily the only vegetables that are more nutritious when cooked or heated, but the point is that it doesn't really matter if you can't eat them raw. If you know that there are certain vegetables that you can safely eat when they've been heated or cooked, then don't worry about loss of nutrients. The important thing is to try to get your veggies any way you can! So the raw foodies can keep their fancy date balls that I can't eat without my throat swelling. I'm going to feel pretty good tonight when I saute up a batch of kale and eat it with a side of brown rice from my freezer. * Please note as always, I'm not a medical practitioner and the posts on this site are not meant to replace the advice of a doctor. Most fruits and vegetables are safer for people with OAS to eat after they've been cooked or processed, but everyone is different and some may still react to some foods, so it's always a good idea to check with your doctor before trying foods you might be allergic to. Miglio, Cristiana, Emma Chiavaro, Attilio Visconti, Vincenzo Fogliano, and Nicoletta Pellegrini. "Effects of different cooking methods on nutritional and physicochemical characteristics of selected vegetables." Journal of Agricultural and Food Chemistry 56, no. 1 (2007): 139-147. Kahlon, Talwinder S., Rebecca R. Milczarek, and Mei-Chin M. Chiu. "In Vitro Bile Acid Binding of Mustard Greens, Kale, Broccoli, Cabbage and Green Bell Pepper Improves with Sautéing Compared with Raw or Other Methods of Preparation." Food and Nutrition 3 (2012): 951-958. Clifford, Alexander, and Paul Dawson. "Culinary Method Affects the Antioxidant Activity of Collard Greens (Brassica oleracea)." Journal of Food Research 1, no. 4 (2012): p66. Great commentary Danielle! I applaud your ability to stick up for yourself and your condition. Somehow, innately, I believe that cooking food is better than eating it raw, even if it is just steaming or sauteing. Never a fan of steak tartar, or sushi, I also prefer to eat all foods cooked with the exception of salad greens and even sometimes, I add them to soup instead of making a salad. The why had not occurred to me. I am glad you brought it forward. Thanks so much, Eileen, and glad you found the article useful! I love greens in soup, too. I must confess, though, having grown up on the West Coast with a huge Asian community I'm addicted to sushi and love raw wild salmon and octopus ;) That may be because it's the only raw food I can eat without fear of allergic reaction, though! Sooo awesome, thank-you!! I have OAS and eat NO raw fruits/veggies... certain spices, gluten, soy, etc... you know how it goes! It get frustrating for sure, I eat a crazy healthy diet, better than literally *anyone* I know, so for some to "presume" that we somehow "brought on" these food allergies is insane to say the least! lol! PS - LOVE your site and WILL be buying your cookbook very soon! It's the first one i've ever seen like it.... your site and your spirit lifts me up when i'm feeling down. Thank-you! Hi Carla, thank you so much for your kind words, it's very sweet of you! I love the little patchwork purses you have on your site. Who'da thought that being able to eat raw food would be a luxury, right? It's a strange allergy alright, and fairly newly discovered so there's not nearly enough information out there for people. I found your blog as I was searching for gf cookie recipes to pin on Pinterest. My adult son has OAS. It showed up when he was a teen. Certain fruits and veggies that he had always eaten (raw) were suddenly very irritating to consume. Eating healthy became a bit more challenging for him. I think your book will make a great Christmas gift for him! Hi Serena, I hope he (and you) find the book helpful! I know how frustrating it can be to have to avoid some of your favorite foods, and the annoying reactions when you slip up and have something you shouldn't. Thanks for sharing this insightful post! As someone who eats lots of vegetables and fruits, both raw and cooked, I found your research references quite interesting. I have studied raw food preparation and felt that it was the way to get maximum nutrition from fruits, vegetables, nuts, seeds, etc. however, I have heard this argument for the value of cooking foods before, therefore I do eat both lightly steamed, sauteed as well as raw foods now. But I never microwave. I also noticed that my body and metabolism has changed over time. The fact that some people become sensitive to foods that they were able to eat before is another important point that you made. Our bodies are constantly changing,so we can't take anything for granted. I enjoy reading your blog and I look forward to reading your book. Thanks, Deborah, glad you found the post insightful! I think it's important to always consider all sides of food fads if we can. A lot of food movements advocate for one thing or another, but sometimes there are unforeseen consequences or complications (i.e. everyone's been going gaga about quinoa as the new super food, and as a result it's driven up the cost of quinoa in countries that produce it and people there can no longer afford it as a staple food). There's always something, right? I am thrilled and grateful to have found your blog, and I just ordered your book. My fourteen-year-old daughter has numerous anaphylactic food allergies and was diagnosed with OAS at age 5. The anaphylactic allergies are easy to live with (speaking only as a mom, not an allergy-sufferer) compared with OAS, and my resolution this year is to move beyond sautéed apples and stir-fried spinach and give my child more options. I'm excited to try your recipes -- the thought that I might be able to make my kid a smoothie is enough to make me weep with relief! Hi, Thanks so much for your blog post! My daughter (at age 5) has been a huge raw veggie fan since she was able to chew them. Unfortunately, she has recently developed pretty bad seasonal allergies & as a result has now reacted to bell peppers (hives around lips & itchy, swollen throat). We went to the allergist, where they confirmed with the skin prick test allergies to tree, mold, dust, dander, etc. They also tested for bell pepper, black pepper, oranges, watermelon (all of which came back as allergies-- the pepper being most severe. They prescribed her an epi pen & gave us an anaphylaxis action plan. This of course freaked me out as a mom & made me feel like we have to avoid peppers like the plague, but the more I read, the more her symptoms seems to look like the oral allergy syndrome that you talk about. It seems though, that they only way to tell is by testing it. This feels like a huge risk of her safety. Do you have any suggestions or comments? How did you go about experimenting? Are all cooked veggies always ok for your oral allergy? Thanks so much for the helpful website! Hi Beth, sorry to hear about your daughter's allergies. I know how frustrating it can be! Well for myself I did just do trial and error, but my allergies aren't really anaphylactic severe so I would definitely proceed with caution in your daughter's case if you decide to try it. If your allergist didn't suggest OAS, it's probably a good idea to ask them about it - not all allergists and doctors are familiar with it. I've heard of some people testing allergies by applying a small piece of food to the skin and taping it on there for a few hours to see if the skin reacts. The chances of anaphylaxis are, apparently, less likely this way than by ingesting. This might be an option for testing cooked food, too, for your daughter. However, I definitely think it's a good idea to ask your allergist or doc about this. For myself, I can have most fruits and veg that have been well cooked (boiled, steamed, or baked), but not wheat or certain nuts. If certain raw foods are less reactive, I'm more likely to tolerate them with less cooking time also. Unfortunately there's not a formula for this, as there are many proteins in foods and people react to different ones, and there hasn't been enough testing yet to figure it all out. I hope that helps a bit and good luck!